As a researcher on the p4ges project and a member of the IUFRO International Council for Madagascar Bruno Ramamonjisoa presented on the project. The International Union of Forest Research Organization is a global network of cooperation in forestry. It comprises more than 15,000 scientists in 700 member organizations in over 110 countries . 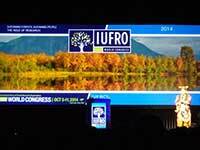 The IUFRO World Congress is held every 5 years. More than 3,000 scientists, managers and forest owners attended the World Congress in the US in October 2014. The conference theme this year was "sustaining forest, sustaining people, the role of research" and Bruno Ramamonjisoa presented a poster submitted as an oral presentation but accepted as a poster) on the p4ges project. Six plenary sessions out of 18 and one of the seven technical sessions dealt with ecosystem services. Only 11 of the 56 scheduled presentations were for payments for environmental service. They looked at carbon PES, hydrology and political aspects of redistribution the payments. None dealt with the theme of the p4ges investigation into the role of PES in the fight against poverty. The "choice experiment" that is used by the working group 6 of p4ges is the dominant approach that most scientists have used in their research. The p4ges project is unique in that its components include aspects (those of institutional analysis, harvested products and hydrology) that are not part of research bring carried out in other countries. On the other hand, one aspect that has not been part of an investigation from p4ges is the establishment of an institutional system of income redistribution as was the case in Vietnam.